Boscobel Public Library: Storytime tomorrow 11/28, History Club next Week! Storytime tomorrow 11/28, History Club next Week! Come one come all for pre-k Storytime, Wednesday mornings 10:30 am at the library. This week’s stories are about princes, princesses, knights, castles and maybe a dragon or two. Next Boscobel History Club Meeting will be Thursday, December 6th , 6:30 p.m. in the downstairs clubroom. 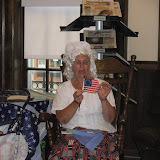 This month's topic will be tall tales, notorious stories and colorful characters from Boscobel's History, followed by open meeting show and tell for people to share their historical treasures and projects, ask questions and figure out the connections that weave our town's past together. This meeting is free and open to the public, everyone is invited to attend. We'll also have updates on Boscobel Library Archive projects and recent acquisitions!